We install and repair the EPDM singly-ply rubber roofing system in Pittsburgh, Monroeville, Stamford, Norwalk, and Greenwich. EPDM is derived from its inclusion of Ethylene, Propylene, Diene Monomer. EPDM is an elastomeric compound, which consists of oil-based by-products and other inclusions of modifiers and stabilizers. These ingredients are synthesized to address the needs of the old days, making it easy to install and less labor intensive. Prior to the 1960s, built-up roofing (BUR) otherwise known as tar-and-gravel roofing, was the only choice offered to homeowners and businesses to cover a flat roof. It was during the late 1960s that the EPDM rubber roofing system was first introduced as a roofing material. It soon became a preferred alternative by roofing contractors rather than the use of the traditional roofing system known as tar-and-gravel. The membrane used with the EPDM single-ply roofing system provides a barrier, which still appeals to many roofing companies given its cheaper cost of production. Although it became a preferred choice by roofing contractors, it is only one of a few roofing system options that should be discussed, offered, and considered by businesses and homeowners. To this day, EPDM is one of the most common roofing systems that we find when we are called to replace or repair a roof for a homeowner or commercial business. Below is a video showing the reason(s) for the leaks that we typically see. EPDM membranes are available in three thicknesses: 45 mil., 60 mil., and 90 mil. (the mil. refers to .001 or a thousandth of an inch). A membrane that’s 60 mil. 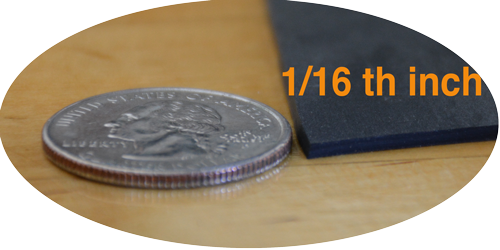 which would be a 1/16th of an inch thick and about equal to the thickness of a quarter. Most roofing contractors will install the 45 mil. membrane unbeknownst to the client, however, a 45 mil. membrane is too thin and susceptible to tears and punctures. Regardless of its popularity, EPDM has a set of drawbacks as a roofing system. Areas where climates are extremely wet or humid, the adhesive materials of and EPDM may fail. The same applies to dry areas. Homes situated in dry places will need a more secure installation of the rubber membrane as it prone to tears and blistering if done otherwise. 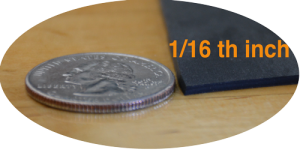 Field tests have shown that no matter the thickness installed, the black color of the EPDM absorbs ultraviolet light and causes the rubber to dry out and get brittle over time providing only a 15 year time frame of protection. The installation of EPDM rubber roof requires adhesives which are used to glue seams together. When the EPDM is fastened to a substrate like plywood or insulation board, the adhesive is applied by a roller. There are many other seams that require the adhesive. Every skylight, vent, drain, air conditioner, cell phone antenna, extractor fan, stove pipe, chimney and satellite dish have seams and because the adhesives fail over time, these seams have the potential to leak. It is inevitable that flat roofs will have foot traffic for snow removal and maintenance workers servicing air conditioners, vents, skylights and the like. Many times snow shovelers pierce the EPDM rubber and unknowingly create the beginning of a leak. Many of the service workers drop or unintentionally leave behind screws, nails, and other sharp objects on an EPDM flat roof that when stepped on, pierce the membrane causing it to leak.